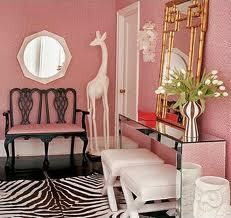 In light of my BIG BIRTHDAY today I wanted to share some rooms with you inspired by my favorite color, pink. Now for anyone who follows me or knows my typical design style, you will know that I am not big on using colors. You will instead find neutrals with touches of organic woods, greys, blacks, whites, golds and silvers. That's just how I roll. Notice in the above space the use of Ikea furniture in this high end looking room. I love that! 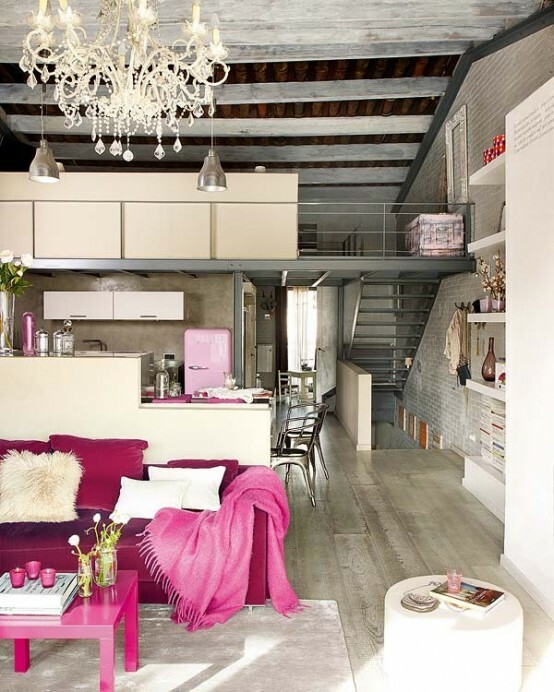 All three of the above pictures are from a loft space and it looks AMAZING! I love the purple sofa and the pink accents. I also love the arc lamp and and the mix of vintage and new like the painted brick walls and the chandelier. And those windows and casually draped curtains? WOW! In this space I love the mix of the luxe fabrics and that the room is grounded by white and brown. Such a grown up version of non-typical grown up colors. There isn't anything that I don't love in this space. 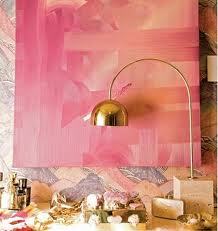 The vintage looking gold lamp <3, the pink canvas<3, I want this vanity space!!! 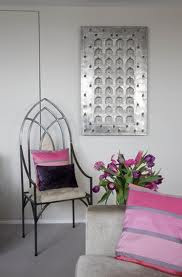 I love the subtle pink accents in thie silver/grey room. This would be an easy to do pink combo. 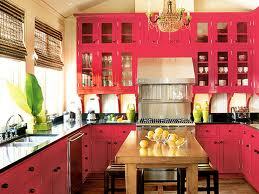 Who would have thought that a pink kitchen could look like this!!!!! Seriously? Notice in both of the two above pictures that there is a pink entry, a gold mirror above a console, and a zebra hide rug. Aparently a popular choice and I can see why. Do I really need to say why this pink door works?! Reminds me of Palm Springs gone right, very right. Have you seen any colorful spaces that you just love even if it's out of your norm? Thanks you guys!!! And by the way the pink washed wood floors would be a pretty big design risk, but if they could be later finished again i.e. are a natural wood that can be sanded then I say go for it!!! Reupholstering A Bench From Target..... Oh Yea!